Colleen Kole creates contemporary art quilts composed of her richly colored, hand-dyed fabrics. Her work is abstract and draws inspiration from architectural elements, the vivid colors of nature and repetitive patterning. She works in an improvisational manner with bold geometric shape and line, with the process informing the outcome. Colleen has been a studio artist for over ten years, exhibiting her work locally, nationally and now internationally in both juried and invitational shows. Her current series, “Time Fragments”, is reflective of her patient interactions as a Physical Therapist and her intrigue with memory and memory loss. Attendance at numerous intensive workshops for surface design and art have formed and fueled Colleen’s passion for textiles. 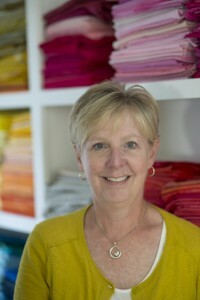 She is a currently a member of the Studio Art Quilt Association and the Surface Design Association. Colleen graduated from the University of Michigan, Ann Arbor, with a Bachelor of Science degree in Physical Therapy . After a rewarding 20 year career in Physical Therapy, she transitioned to her studio as a full time artist. Born and raised in Grand Rapids, MI, she resides there with her husband and three children. Vermont is also a place called home by Colleen and her family. I can’t remember a time when I didn’t use my hands and observational skills for work . As a physical therapist for twenty years, my hands were in constant use. They were used to determine the location of physical dysfunction in a patient and to help facilitate healing with massage or stretching. My sense of sight was used continually to monitor for problems or again to monitor healing and progress. It was a very satisfying career. I now have the overwhelming privilege of using those same hands and observational skills as a textile artist who makes contemporary art quilts. The quilts are made, not for functional use, but to please and intrigue the viewer. 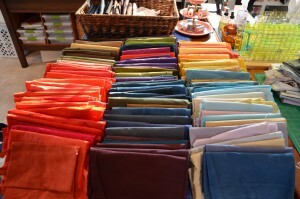 I start by dyeing my own fabrics so I then have a beautiful palette of colors to draw from. 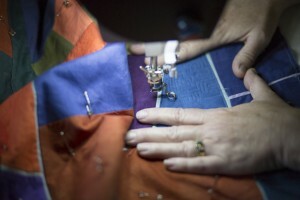 Without patterns or templates, I intuitively cut freehand into the fabric using a rotary cutter. Choosing bold geometric shapes and decisive lines, I use a design wall to compose intuitively. I may or may not start with a rough sketch. But, most of all, I respond to the interaction of shapes and lines on the design wall, improve upon that composition many times and then finalize the design before stitching together on a machine. The final step is adding machine stitching to three layers which adds another level of texture and design to the piece. With my art, nothing delights my heart more than the tactile nature of the fabric, the color I can achieve with dyeing and design and the final ability to put both together with a needle and thread. I reside in Grand Rapids, MI with my supportive husband and three kids. Vermont is the second place we call home. Mastery: Sustaining Momentum, Invitational, European Patchwork Meeting, Sainte-Marie-aux-Mines, France, September 14- 17, 2017. Curated by Nancy Crow.